The team behind the Well-Being Index takes user requests and recommendations very seriously. That's how we learn and adjust to what healthcare providers need from our tool. It's important to explain the origin of the updates made to the WBI, so all users can take full advantage of every feature. Additionally, the WBI team conjures up ideas for improvements to the tool. Improvements that you, the user, may not have even discovered yet! We've included some of recent updates below, along with the stories behind them. and access free resources concerning individual well-being. Though this particular plan is meant for individual reporting only, participants often assess their well-being within a small group of coworkers or colleagues. Promoters didn't have a need for the full-feature reports; however, they did need a way to track and compare multiple well-being levels over time. The WBI team took these requests into consideration and implemented an update that allows Promoters to understand the distress levels of their group compared to other sub-groups and the national average. The specialized report costs $999 and provides a snapshot of how group participants are doing overall, as well as compared to the national average. The snapshot reports are delivered in the forms of a PDF and JPG within two business days of the request. Approximately one year ago we added a feature to the WBI Champion plan called "Process Improvements." The Champion plan is the highest level of the tool and includes access to all WBI features. Process Improvements offers participants the chance to anonymously give feedback on how their organization is reducing burnout effectively, or how it can improve. The problem with this particular feature was that organizations were not receiving enough context around the feedback, or simply weren't receiving enough feedback altogether. After a year of implementation, Process Improvements is now streamlined to make it easier for participants to provide feedback. Now, instead of forgetting about the notification or enduring survey fatigue, participants will be able to immediately answer Process Improvements questions after the nine-question WBI assessment. The Process Improvements survey takes just a short amount of time to answer, and the participant's critiques or compliments will be fresh in their mind. Sign up for an account or log in. 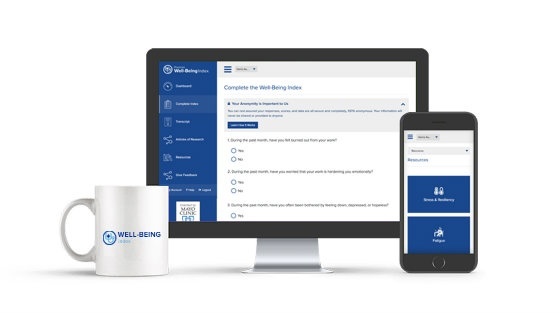 Answer the nine Well-Being Index assessment questions. Choose between answering the Process Improvements questions or skipping to your results. Your answers will not affect your score. This feature update is intended to help provide organizations with more context and overall feedback. The WBI team found that Champion plan organizations needed the ability to dig deeper into their well-being results. To best prioritize where resources for interventions were being used, organizations needed to know the percentages of the most and least burned out populations. "Advanced Reports" is a feature available through the Champion plan that allows admins to go beyond the standard report breakdown. They also focus on how distress scores break down by custom groups. However, organizations were interested in the aforementioned percentages to find the "High Level of Distress" threshold. Thus, a toggle has been placed within the Advanced Reports to calculate the percentage of participants who meet the High Level of Distress threshold. This update is intended to help organizations more properly allocate resources amongst WBI participants. The WBI team hopes these updates help your organization or group tackle burnout and promote well-being more efficiently. To speak to a Well-Being Index specialist about the updates or reasonings behind them, please request a time on our calendar.